Forte sounds great, integrates seamlessly and, while it's not very original, looks good. High-quality I/O with all Focusrite's preamp and signal conversion know-how. Nicely designed, feature-packed and controllable from interface. Two free plug-ins. No phantom power without mains connection. Looks aren't exactly original. Focusrite's Forte USB interface looks great, if not exactly original. Brushed aluminium hasn't always been so 'now' but Apple's decision to use what was once seen as a cold industrial material on a range of its desktop and laptop products has had an interesting knock-on effect. "This is no copycat product: with PC and Mac compatibility and a competitive price point by Apogee's standards, Forte deserves your attention"
Whether it's simply because we like products which 'match' our computers, or that the desirability of Apple's designs now tempt us on a subliminal level too, companies such as Apogee have been quick to ensure their interfaces resemble the computers into which they record audio. Focusrite has followed suit as well and Forte, its new flagship portable interface has a gunmetal grey design, an OLED display housed beneath black plastic and a prominent rotary dial in its upper surface. This is no copycat product, though: with PC and Mac compatibility and a competitive price point by Apogee's standards, Forte deserves your attention. Forte is a nicely shaped, gently curved interface designed to live between you and your computer. "Forte's back panel houses stereo outputs, the USB 2.0 connector and a break-out cable to two XLR inputs and two 1/4-inch input"
It features a prominent rotary dial in the middle of its lower section below the OLED display, while its back panel houses stereo outputs, the USB 2.0 connector and a break-out cable to two XLR inputs and two 1/4-inch inputs. These are for line level and guitar sources, while the front edge features a 1/4-inch headphone output. 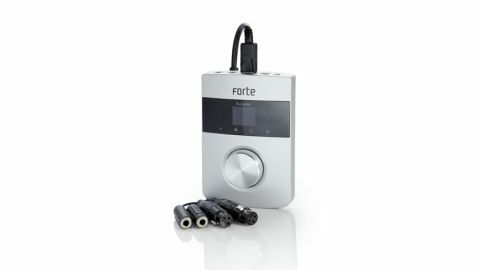 While Forte is a 'two-input' interface, the fact that there are four physical connections - two XLR, two 1/4-inch - is welcome, as it saves the reconnection time required by combi jacks. There's no installer CD in the box, so accessing driver and controller software means a visit to Focusrite's website to register your kit. The Forte Control software panel, allows in-depth configuration of input and output controls including gain, phantom power settings, phase reverse and pad options for the mic inputs and output and headphone levels too. "It's worth noting that while Forte can be buss-powered, you'll need to connect the external power supply if you want to use phantom power"
It's worth noting that while Forte can be buss-powered, you'll need to connect the external power supply if you want to use phantom power or to increase output levels dramatically. You can also download Focusrite's own Midnight plug-in suite which offers two plug-ins: models of the ISA110 EQ and ISA130 compressor modules from the original Focusrite Forté console - a worthwhile addition to the bundle. Software control isn't everything though and it's good to see that Forte can largely be configured from its front panel too. There's a even a fourth option to access limited DAW control. As you'd expect, with Focusrite's legendary pres and A/D conversion employed Forte sounds superb. With audio spec of up to 192kHz at 24-bit, it's crystal clear, and there's plenty of parameters directly controllable from its clear, well-designed OLED display. Yes, this is an interface which has carefully studied the competition at the design stage, but its cross-platform compatibility should ensure it gets its own band of followers.